Cauliflower in a taco? You’ll be amazed at how delicious it is combined with crunchy chickpeas and a spicy coriander pesto. Preheat the oven to 200ºC (180ºC for fan assisted ovens), gas mark 6. Place the cauliflower florets in a large bowl with the oil and salt and toss to coat. Spread out in a single on a large baking tray. Mix the crispy chickpea ingredients in the same bowl then spread on a second large baking tray. Bake both trays for 25-30 minutes, stirring once until the cauliflower is tender and browned in places and the chickpeas are golden and crispy. Meanwhile, place all the pesto ingredients except the oil, in a mini food processor or blender and process until finely chopped. With the motor running, gradually drizzle in the olive oil through the feed tube, stopping halfway through to stir the mixture with a spatula. Heat the tortillas as directed on the packaging. 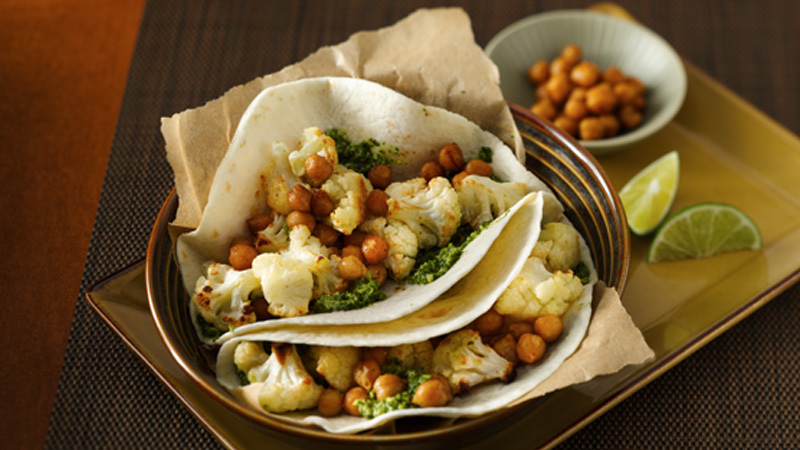 Spread some of the pesto on one half of each tortilla then top with the roasted cauliflower and a spoonful of the crispy chickpeas (serve the rest in a small bowl). Fold tortillas over the filling and serve with lime wedges. If you prefer use fresh parsley or basil instead of the coriander for the pesto – or a mix of herbs. A drizzle of natural yogurt mixed with a squeeze of lime, some freshly ground black pepper and a pinch of salt will make a great accompaniment.